Tom Brady rookie cards are a lot like the rack of chocolate bars at the corner store. There's loads to choose from, all of which can be good in their own way. It's honestly tough to go wrong. Still, we have our favorites and personal preferences. Ask your wife—not all chocolate bars are created equal. Just the same, neither are Tom Brady rookies. 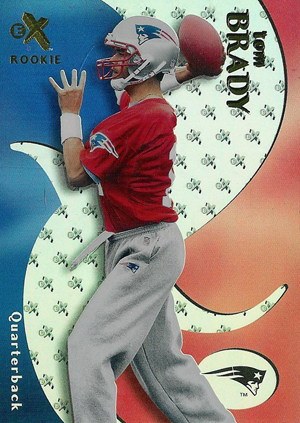 With more than 40 Tom Brady rookie cards to choose from, the options can be daunting. To help with that, here are our picks for the best Brady RC choices. While value and rarity were taken into consideration, we've also included a couple of picks that are a little more common and not quite as pricey. 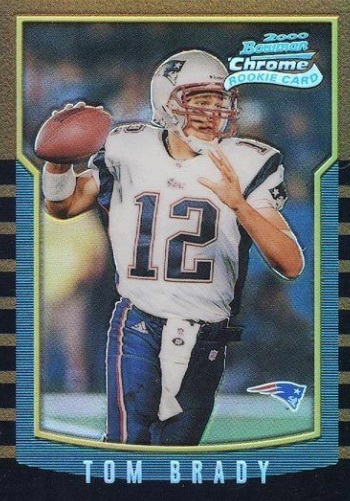 Shop for Tom Brady rookie cards on eBay. At this point, no Tom Brady rookie cards are dirt cheap. That said, with multiple Super Bowl rings on his hands and his name becoming increasingly common in the record books, his legacy is cemented. So, when it comes to risk, there's not much with this modern legend's first cards. Although rookies are regularly among the most pursued Tom Brady cards, there are plenty of other choices worth keeping an eye on. Track his popular cards on eBay with a real-time Tom Brady hot list for the most-watched auction listings. Fairly cheap in comparison to many other Tom Brady rookie cards, the Metal card is still an impressive choice even without a limited print run. There is also a non-numbered Emerald parallel. The full Patriots uniform for Brady is a plus, and as the list shows, quite uncommon. Found in both a Hobby and Retail version, the main difference for 2000 Crown Royale is the background color. The Hobby release can be seen below and Retail has a dark red background. Although the die-cut design is distinct, it can make the condition more of an issue. 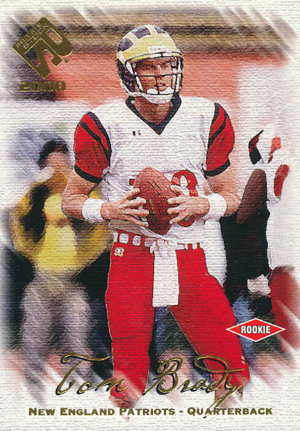 Collectors will likely notice the many college, Senior Bowl and practice jersey images used for Tom Brady rookie cards. While these are not normally ideal, they can still produce strong interest with collectors. That includes the Black Diamond rookie from Upper Deck that comes in a base version in addition to a gold parallel, numbered to 500 copies. 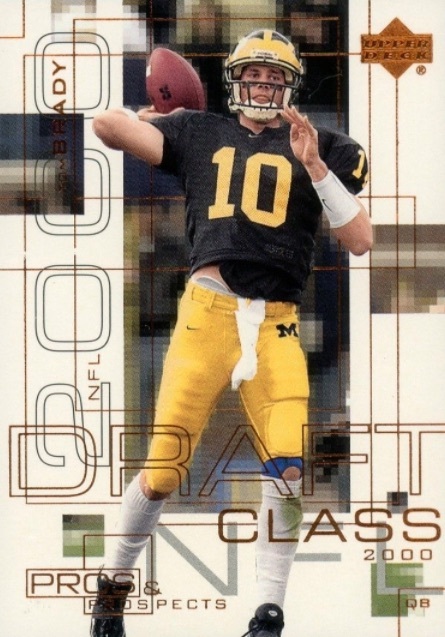 Showcasing his time with the Wolverines, this Draft Class subset in UD Pros & Prospects carries a print run of 1,000 copies. Like Black Diamond and Graded, Pros and Prospects is another Upper Deck release with a busy design. 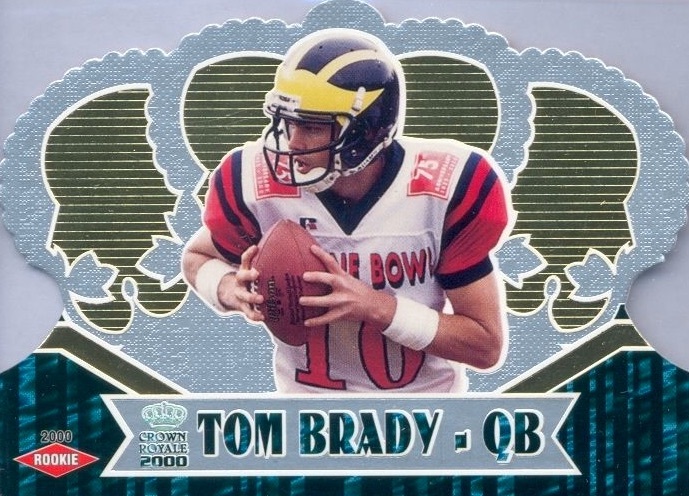 Tapping into the SP Authentic look slightly, the Tom Brady rookie card in the oddly-named UD Graded falls in the more affordable range but still sells for hundreds. While the print run of 1,325 cards is not exactly rare, it does appear to be in less supply than one would expect. Fleer's E-X line is one of the hobby's overlooked gems. And while the brand does have its fans, it failed to reach a level of mainstream appeal. The 2000 E-X Tom Brady has a clean design and a clear photo (because everyone wants a sharp shot of a quarterback's sweat pants). Numbered to 1,500 copies, it's somewhat rare but not impossible to find. 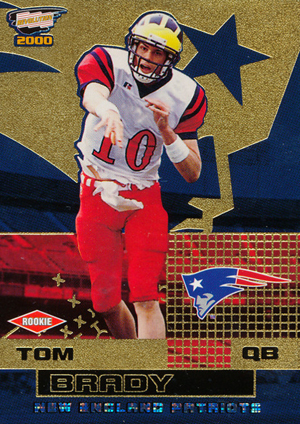 The 2000 Bowman Chrome Tom Brady rookie card is one of the few to have an in-game action shot. Combine that with the card's brand recognition and you've got the best of Brady's non-numbered rookies. Refractors, like the one shown below, are also very popular with collectors. 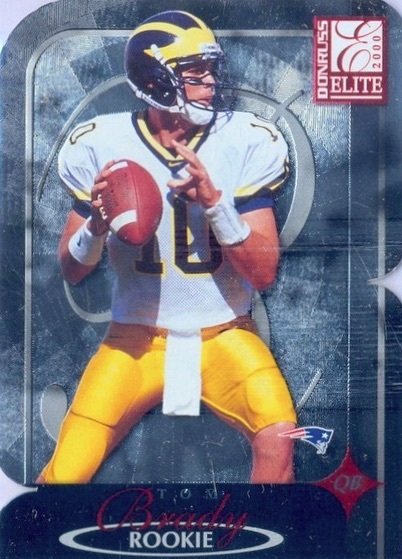 Pictured as a member of the Michigan Wolverines, the 2000 Donruss Elite Tom Brady is another card that benefits from a brand with an established history in the hobby. The foil-based card is numbered to 2,500, with the first 500 in the print run being die-cut and the final 1,500 issued as regular cards. Although many of the Elite designs blend together, this one stands out a little more than normal. 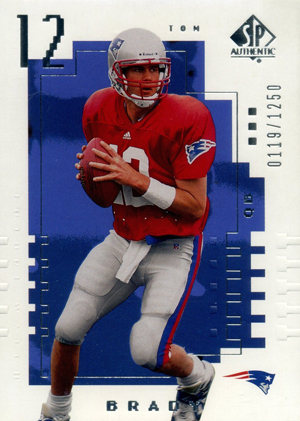 Limited to just 750 numbered copies, the 2000 Playoff Momentum Tom Brady ranks among his rarer first-year cards. In addition, the etched foil background helps set it apart. The only reason the 2000 Pacific Private Stock Tom Brady breaks into the list is because it's got the lowest serial numbering. Hindered by a run through the Photoshop filters, the quarterback looks like he's ready to shoot laser beams from his eyeballs. As cool as the thought of laser beams is, it makes for a pretty ugly card. That said, with just 278 numbered base copies, it's legitimately rare and garners solid attention on the secondary market. However, other versions include Silver (#/330), Gold (#/181), and Premiere Date (#/95) parallels, as well as a Retail version (#/650), so the overall numbers aren't quite as low. 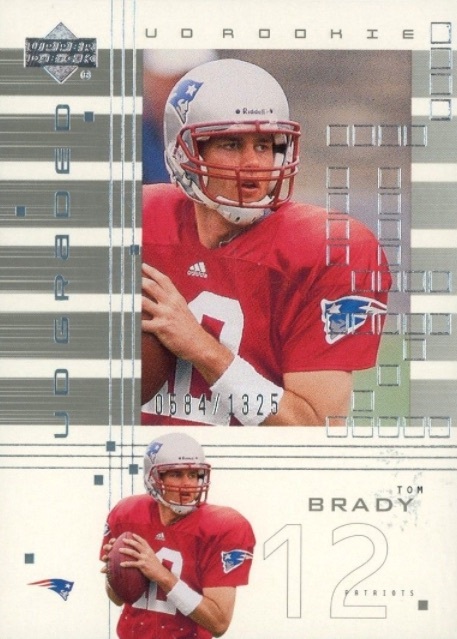 A colorful foil look and extremely low numbering are what make the 2000 Leaf Limited Tom Brady notable. With a print run of only 350 copies, Limited is one of his rarest cards. Because it was one of the final releases of the year, it's also bolstered by an in-action photo. There's a lot going on with the 2000 Pacific Revolution design. The background mixes gold, blue, red and black colors, not to mention rainbow lettering. It probably shouldn't work, but it does. Also helping the appeal, with just 300 total cards, it's his second-rarest rookie. While it hurts that Brady isn't pictured in his Patriots uniform, this is the case for many of his first-year cards. 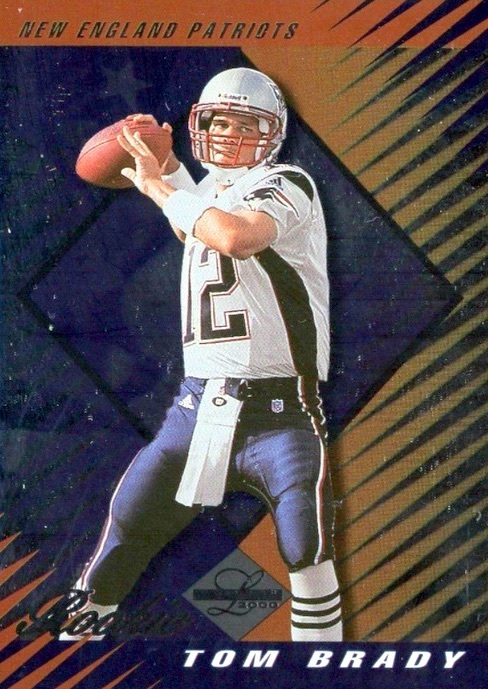 Despite the large print run, the 2000 SPx Tom Brady rookie remains one of the best options for collectors. Numbered to 1,350, it has a high-tech feel and a premium design. The SP Authentic name has long been popular with several types of collectors as set builders, player collectors and rookie collectors all vied for a relatively small number of cards. 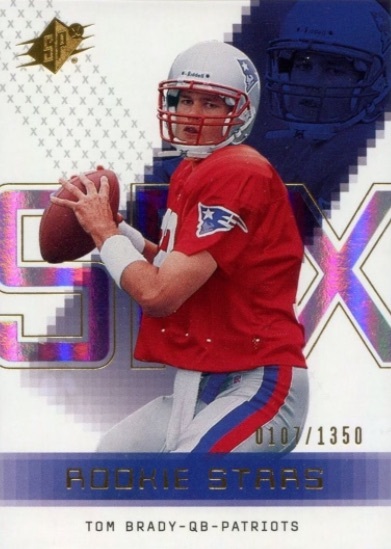 Basic supply and demand principles mean that prices of the 2000 SP Authentic Tom Brady rookie card outpace many of his much rarer rookies that don't have quite the same brand appeal. 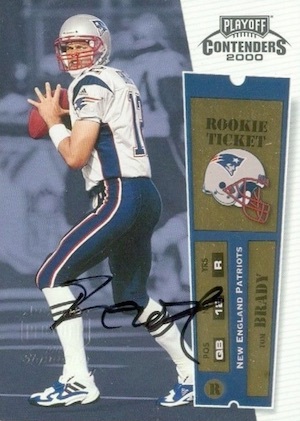 It's hard to believe that there is just one autographed Tom Brady rookie card. 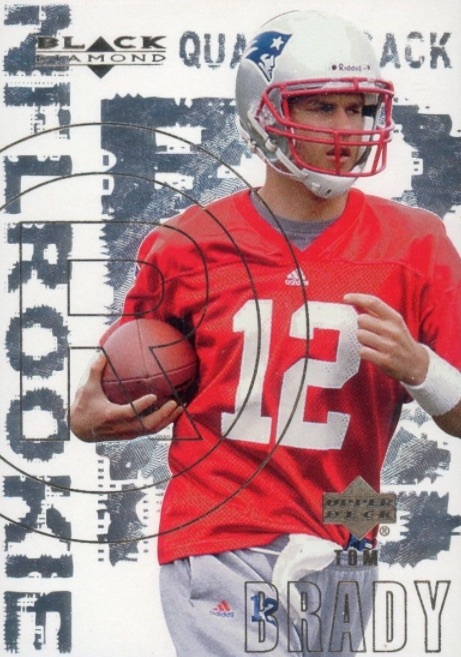 Of course, there are several different Tom Brady rookie-year autographs in 2000 products as part of various inserts, but the iconic 2000 Playoff Contenders Tom Brady is the only official rookie with his signature. Although it is not numbered, 2000 Playoff Contenders comes with the distinct Rookie Ticket theme, further boosting interest. The rarest choice is the Championship Ticket parallel that is numbered to just 100 copies. 2000 Playoff Contenders TOM BRADY Bulger Round Numbers Rookie AUTO!! CLEAN!! I’d like to see UD Graded on the list ! C’mon man ! Leaf Limited should be higher..
more rare = more value ..no??? fluffsta � All good options. With over 40 rookies and only one signed card, there are plenty of choices that could lay claim to the top ten for Brady. Also, as noted in the article, the list is not based entirely on value or rarity. It’s not numbered, but I always thought his Metal RC was underrated. 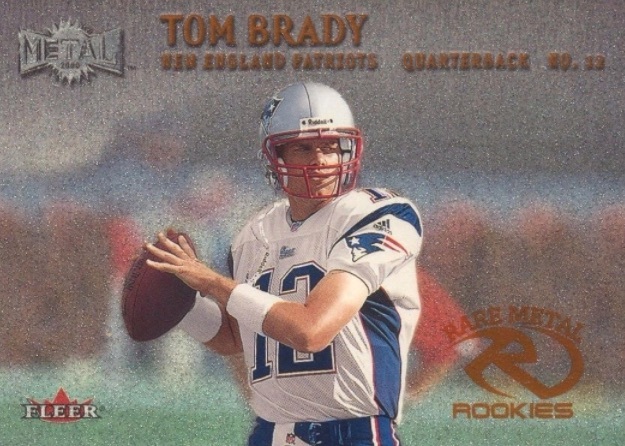 I recently decided to see how many of the Tom Brady 2000 SP Authentic rookies have been graded. I went to Beckett’s website, of the total 1250 cards produced by upper deck, Beckett has graded 850. I then went to PSA’s website and found out that they have graded 427 Brady Sp Authentic rookies. 850+427=1277. 1277 have been graded 1250 have been produced. I thought Beckett and PSA were the industry standard for grading? How could 27 counterfeits have gotten by them? At this point, SP Authentic unopened boxes are fools gold. Numbered rookies fell one per box and there are 60 different rookies. That means your odds are 1:60 boxes to land a Brady. There are no other good RC in that set, so the odds are way to long. Plus, all the cases where someone got a Brady early on while breaking the case, the other boxes are now on EBAY. They are effectively searched. On the numbers for the graded SPA rcs you have to take into consideration cross grading. So doubtful any counterfeits have been graded but it could happen. GANGSTACRO- I agree it’s not smart to buy SPA boxes. If you have $400+ to spend try some of the others with better odds. Although in 2000 I bought only 2 boxes of SPA and both RCs were Brady. Sadly I sold them way too low in 2005. I lost a ton on those. You guys do realize I could bust my card out and resubmit it hoping for a higher grade right? Ive done it on multiple cards that looked cleaner than the grade and gotten a 9 to a 9.5 or something of the sort. Therefore my one card couldve been graded 2 or 3 times. Just found 2002 Tom Brady rookie. Had no idea I owned this lol. But I do now. Its a donruss. Anybody have a smigin of what it is worth? How do you tell the difference between the glossy versus non glossy version of the 2000 Fleer Tradition #352 Tom Brady and Dave Stachelski RC? Glossy is printed on the back above the brand logo at the bottom of the card. The article leaves out mention of the 2000 Contenders Championship ticket which is numbered to only #100. 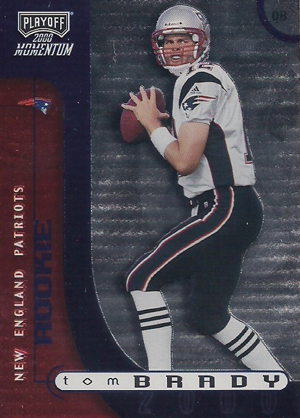 In my opinion this has to be the most valuable Brady Rookie ever made. As the article nicely brings out, there are technically only 2 official Brady Rookies. The 2000 SP and the 2000 Contenders Rookie Ticket versions. The Contenders is by far the more desirable since the SP version is not Autographed. Add to that the 2000 Contenders Championship Ticket which is basically an autographed Rookie Ticket but is serial numbered to #100. That card is by far his most rare and valuable Rookie Card on the Market. Others can try to pretend they may have a rarer card but it’s simply not the case. Only 100 of these things exist of the greatest FB player possibly athlete to ever live. It’s because many people will send in a card to be graded and if they are not satisfied with the grade will send it back again to the same company or a different one. So some cards are essentially graded more than once! Honestly, these grading companies are shams! I once sent in a card to PSA and got a 9. I cracked the case and re-submitted it and got a 10. I knew then that this grading business is subjective, as well as open to corruption from companies that send in huge amounts of cards who tend to get favoritism and higher grades than the regular guy. I see some cards graded gem that are clearly off-center. I’m sure anyone who has been in cards a long time knows this. Im not sure where u r getting only 2 official rookies as this is just simply not the case. Also a championship ticket is a parallel and therefore not a true rookie. This eBay culture of anything from a players rookie year is crazy. Parallels, Inserts, anything not numbered within the confines of the base set IS NOT A ROOKIE ! Time to update this list, including SP’s and Base. This list is about 60% accurate. As stated, the list identifies some of the top Tom Brady rookie cards. If you believe better options are missing, feel free to mention them. Reply to John: I would have to respectfully disagree. Though I do agree many parallel cards of players exist and just because its in the set of his rookie year, doesn’t make them their “Rookie Card”. In the case of the Championship Ticket, It’s a direct parallel to the Rookie Card itself and not simply an insert card. It’s the identical card, the only difference being a serial number. I think other agree since this card went for $250K on the open market, nearly 10X the amount that of the un-serial numbered version. UPDATE: The Tom Brady Championship Ticket just sold for over $400K . I think this last sale makes my point for me. Only 100 of these cards exist and only 80% are gradable. Out of those 80% only 67 have been graded an 8.0 or better. That would make this particular card valuable beyond imagaination and puts it on par with the Honus Wagner 1909 T-206 Sovereign Cigarettes card in rarity. Additionally Tom Brady is the most winning player to ever exist in any sport on the earth! I don’t think even the savviest collector right now is understanding the full relevance of this Champiionship Ticket card. Using pure logic and basic math, at some point in time this card has to become the most valuable sports card to ever exist. I would say $400K of USD makes my point for me!